Amazing Home on Mt. Crested Butte w/ Hot Tub and Gorgeous Views! Overlook represents the epitome of true mountain luxury! This massive home sits at the base of Mt. Crested Butte, perched above town with sweeping views of the valley below. The cul-de-sac location provides a private and quite experience only minutes to the base area and downtown. With no less than 5 decks, an outdoor private hot tub, and 2 living rooms, this home is ready for entertaining! Entering through the front door, you walk into the second story and your senses are overcome by the views of the mountains from the large, open Great Room. This huge space combines the gourmet kitchen, living, and dining areas. 2 huge decks (one with a gas grill), walls of windows and a wood burning fireplace make this the central gathering location in the home. Off the great room is a junior master with a full bathroom and private deck. Continuing upstairs to the 3rd story is a loft/office area overlooking the great room which includes wi-fi, printer and fax, and a pull out loveseat. Opposite the loft is the master suite. This beautiful 'hideaway' has million dollar views, a private deck, a deep jetted tub and a slate steam shower! Head back downstairs to the first floor and find 2 additional bedrooms, the media room/second living room, and outdoor hot tub. The first bedroom is perfect for the kids hangout, offering 2 custom, aspen bunk beds (4 beds total). The next bedroom is a cozy set up with a queen and a day bed. A beautiful, tiled bathroom is shared by both bedrooms. The media room contains a large screen HD (sat) TV, stereo, card/game table, foosball and semi-circular sectional couch. This is movie central! At the end of the hall a spacious laundry room/mud room located just off the garage where a 1 car (heated) spot keeps your vehicle toasty on those chilly winter evenings. A long driveway and additional parking by the front door (2nd level) offer MORE than enough space for your cars and toys. Come to Overlook for the ultimate mountain experience...Just be warned, may never want to leave! YOU SHOULD KNOW THAT THIS HOME IS FOR SALE AND YOU MAY BE REQUIRED TO ACCOMMODATE A SHOWING GIVEN A 24-HOUR NOTICE. IF THE HOME SELLS AND THE NEW HOMEOWNERS DO NOT WANT TO HONOR ANY EXISTING RESERVATIONS YOU WILL RECEIVE A FULL REFUND. Rebecca was very helpful when we had internet problems. Fantastic property! We have stayed at several places in CB and this is one of the best! Christina was always helpful and very pleasant. It was a magical weekend filled with many opportunities to visit with each other in such a beautiful place. Thank you! Perfect. The view was spectacular. Loved all the windows the dining room was ample for our family. Hot tub and steam showers a big hit! MANAGER RESPONSE: LeeAnn, we're happy to hear you loved Overlook as much as we do! 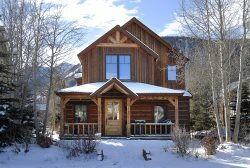 We look forward to hearing back from you the next time you're planning a trip to Crested Butte!